Why I need for an account on ZX Online? All users, who have an account, may Save Game Progress to the server in any game and create Game Collections (like on Youtube, for example), participate in game competitions, get achievements and more other cool things. Account creation is FREE and will take only a minute of your precious time. To make an account simple press Sign In button and follow directions. We recommend using Social Accounts for faster account creation. Among the games that came out long ago, there are ones, that evoke warm feelings even after decades. It actually does not matter on what platform these games were released, what kind of graphics and sound design was there (and whether it was at all!). One of these games for the Spanish programmer Jordi was “Alley Cat“, which was released in 1983, first on Atari, and in 1984 on PC. The idea of this arcade game is quite simple: you control an alley cat that can move along the street, jump on trash cans and a fence. By jumping from the fence, he can get inside the building, in every room of which another adventure awaits him: either empty all the food from the dog feeders, catch all the fish in the fishbowl, eat the canary in a birdcage, thoughtlessly left by the owners in dangerous proximity to the window or something else. Each room has its own task. The cat’s life is complicated by dogs, darting down the street and in the house, spiders and brooms. After each adventure, the cat can pay a visit to a girlfriend (of course, if he will be able to get through the complex maze to her attic!). 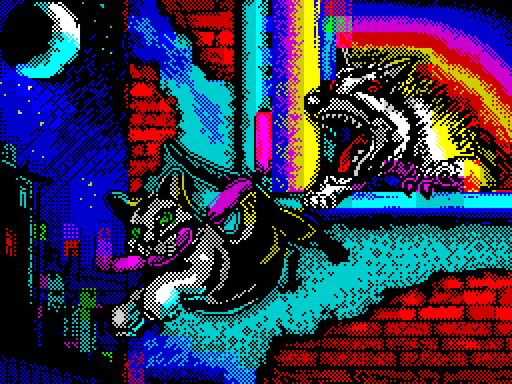 In this cool game’s demake for the ZX Spectrum, its author Jordi decided that according to the plot a cat-girl named Misifu, would save her friend Fred, who was stolen and locked in the attic by the evil Dogads (it is not clear who they are, but it is obvious that they are bad guys). Add here perfectly transferred music by Oleg Nikitin (n1k-o) and graphics from Evgeny Rogulin (ER) (of course, you already know them from previous games – Aliens: Neoplasma, Vradark’s Sphere and others) and get a masterpiece, which cannot be missed. The demake (called “Misifu la Gatita”) is already available in ZX Online, where you can download it right now. We will not hide that the game can be downloaded from other resources as well, but if you want to get first-hand all the fixes and new versions of the game and keep a direct link with the developers, you better get a special ZXO license key (it’s free!) on ZX Online.